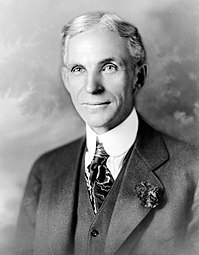 Tionsclóir is innealtóir meicnice ba ea Henry Ford, agus bhunaitheoir an Ford Motor Company (30 Iúil, 1863 – 7 Aibreán 1947). Rugadh Henry Ford gar do Dearbom, Michigan.sa bhliain 1863. Ó 1891 thosaigh sé ag obair do chomhlacht Edison i nDetroit. Ach ina am saor, shaothraigh Ford feithicil cheathair-rothach, fuinnmhithe ag inneall dócháin inmheánaigh. Bhunaigh sé a chomhlacht gluaisteán féin i nDetroit sa bhliain 1903. Rinne réabhlóid bhunúsach sa tionsclaíocht lena mhodh táirgthe, bunaithe ar líne cóimeála, agus thug isteach a Model T sa bhliain 1908. Faoi 1918 ba Model Ts leath de na gluaisteáin sna Stáit Aontaithe. Thóg sé an coimpléasc monarchana is mó ar domhan ar bhruacha Abhainn Rouge i nDearbom i 1917-38. Ina dhiaidh sin tháirg sé tarracóirí is eitleáin. ↑ Hussey, Matt (2011). "Fréamh an Eolais". Coiscéim. Tugadh an leathanach seo cothrom le dáta an 7 Aibreán 2019 ag 19:15.